In many parts of Canada and United States there is a drive to a minimum wage of $15/hour. Some places like San Francisco and Alberta have already at that historic rate. While all but the most ardent on the political right have little issue with very existence of a minimum wage, the question has been what should it the minimum wage be? 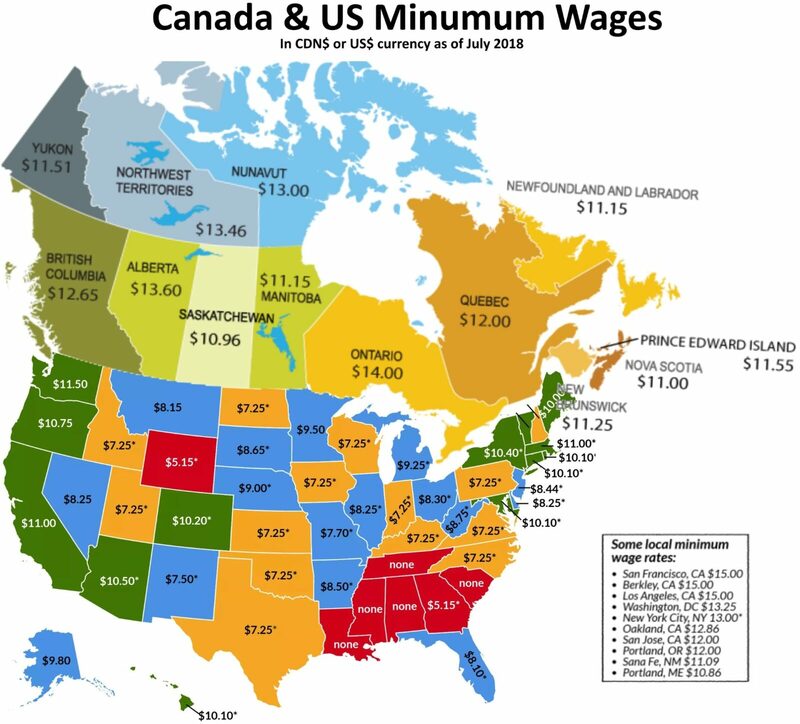 You can click the map to the right to see the minimum wages that are being paid in the US and Canada as of July 2018. We are not going to solve that debate here but we can suggest a logical improvement. Age Adjusted Minimum Wages allow the very young and the very old to be paid less than the “full” minimum wage. This creates opportunities for young people to enter the labour market often by starting out performing skill tasks, like cleaning and storage handling. How much is it worth to have some say “Welcome To Walmart”, “Can I see your Costco bill please”, or to have them clean tables at McDonald’s? The problem with the Australian system is that it is overly complex. It has minimum wage calculations based on the industry, your age, trainee vs regular staff, specific occupation, experience and full time, part time or casual work. It is so complex the Australian Government provides THIS 11 step “PAY AND CONDITIONS TOOL” to figure out your minimum wage. Such complexity is unnecessary, confusing, and ripe for abuse by employers. As you can see in the tables above, about 25% of minimum wage workers in Canada, the United States and Australia are under the age of 21 or over the age of 65. The discounts to the minimum wage for that group can be used to keep price low or pay ‘working age’ staff more… or both.